Life in Kashmir on Sunday came to a standstill due to a complete shutdown called by separatists against the legal challenge in the Supreme Court on the validity of Article 35A, which bars people from outside Jammu and Kashmir from acquiring any immovable property in the state. Shops and business establishments were closed and all kinds of transport remained off the roads due to the strike called by the Joint Resistance Leadership (JRL) of separatists. Train services in the Valley were suspended for 2 days in view of the strike. As was the Amarnath yatra from Jammu as a precaution. 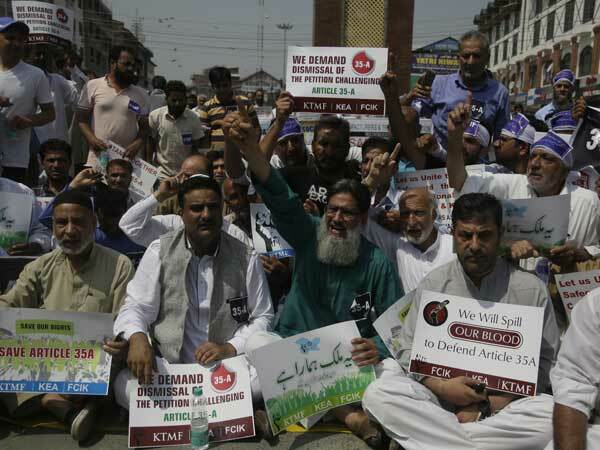 There were reports of partial strike and peaceful rallies in support of the Article 35-A from Chenab valley districts of Ramban, Doda and Kishtwar as well as in Gool, Sangaldan and Banihal. However, the situation across the Valley was peaceful with no untoward incident reported from anywhere. The separatists as well as major political parties including National Conference, People’s Democratic Party (PDP), CPI(M) and the state unit of Congress have been demanding a status quo on Article 35-A, a PIL challenging the validity of which is scheduled to come up for hearing by the Supreme Court on Monday. The state government has filed an application before the Registrar of the Supreme Court, informing that it is going to seek adjournment of the hearing of the petition in view of the “ongoing preparations for the upcoming Panchayat, urban local body and municipal elections in the state”. While the Jammu and Kashmir High Court Bar Association (JKHCBA), Jammu plans to file an impleadment application before the Supreme Court in connection with petitions challenging the constitutional validity of Article 35-A, another group of lawyers led by AV Gupta have passed a resolution for strengthening and retention of the Article 35-A. JKHCBA president BS Slathia calls the provision an aberration. The Presidential Order can’t be an article of the Constitution, he says and stressing the need to abolish it in order to establish gender equality. Gupta however, asserted that Maharaja Hari Singh had executed the Instrument of Accession with certain conditions which later came out in the shape of Article 35-A read with Article 370. Closely aligned with Article 35A is its predecessor Article 370, which came into existence in 1949 and gives special powers to the President to make certain changes to the Constitution without consulting Parliament. Article 370 limits the writ of the Central government. Both these Articles — 370 and 35A —entered the Constitution in 1954, when Prime Minister Jawaharlal Nehru was negotiating the terms of accession with Sheikh Mohammad Abdullah who was the prime minister of J&K.